Why Do Squirrels Like Your Attic and Eaves? Squirrels are extremely adaptable to their environment especially when sharing that environment with humans. In forested areas, squirrels have plenty of places to build nests, forage for food, and sharpen their teeth. When living in a neighborhood, their living space is limited as they must share the landscape with a house, shed, garage, and domestic outdoor pets. One of the biggest attractions for urban squirrels is a cozy attic to hunker down in during the winter and as nesting places in the spring and summer. 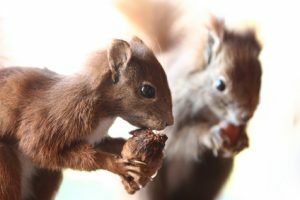 Squirrels have two litters a year – March to May and July to August. During this time, moms-to-be are looking for a safe place to have their babies and a secure place to raise them. As the babies mature, you’ll hear sounds emanating from the attic including chewing and scratching and the patter of feet. Unfortunately, squirrels love to chew and since they’re not in the forest, the next best thing is whatever is handy in your attic. Along with chewing damage, there’s the mess that a group of baby squirrels can make. When your home is invaded, the best course of action is hiring a NJ squirrel removal pest service. At Stern Environmental, we have NJ squirrel removal specialists with the knowledge and equipment to remove the squirrels from your home. 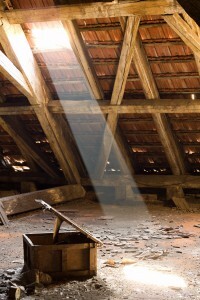 Don’t wait until it’s too late and structural damage occurs. Call us today for an inspection. Imagine that you’re lying in bed one night, almost asleep, and suddenly you hear what sounds like little feet running across the ceiling of your bedroom. Your eyes fly open, and your first suspicion is probably exactly what is going on in your attic – you have a squirrel problem. If you’ve had this problem, then you’re in desperate need of NJ squirrel removal services. This is a problem that should not be tackled on your own. Clearly, this is a problem, and you want to take care of it as soon as possible. Many people have tried setting up squirrel traps themselves, and many people have failed with this method. It really takes a professional approach in order to get rid of these furry pests. At Stern, we offer NJ squirrel removal services that can give you the peace of mind you’re looking for. Contact us today to set up an appointment. We see them all the time frolicking in the trees, running across fences, foraging in the leaves, and pilfering the bird seed stand. It seems like it’s squirrel season all year-round with the bushy-tailed marauders taking over yards, and in some cases, an easily accessible attic. Squirrels are inquisitive and can find weak areas in a structure that serve as an easy entryway into buildings. This usually happens in cold weather and during the months when females give birth. There are two concerns with squirrels. The first is the damage they can do with their gnawing. This is especially true due to their affinity for chewing electrical wires. The other concern is what types of diseases squirrels carry that can affect humans and household pets. Squirrels carry ticks and fleas and both can turn into an infestation if left untreated in the home. Ticks are known carriers of Lyme disease and squirrels can harbor ticks. 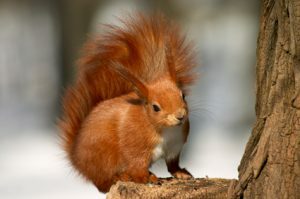 Squirrels can also be carriers of pathogens such as salmonella. For these reasons, if you have a squirrel problem, it’s best to contact a NYC squirrel control company to humanely move the critters. Our NYC squirrel control technicians are standing by to help you with all of your pest control problems. To set up an appointment for an inspection and removal of pesky pests invading your yard and home, give our NYC squirrel control specialists a call.